This blog is, and isn’t, about the breast cancer drug Herceptin. It is about Herceptin in that we report on a study we just published in the journal PLoS Medicine about the health gains, costs, and cost-effectiveness of Herceptin. It isn’t about Herceptin in that the key point is far more general: in the age of personalised and precision medicine, our country’s funding decisions are often blunt and imprecise, some may even say wasteful. We raise some hard and contentious issues – but talking about money and health in the same breath always is. 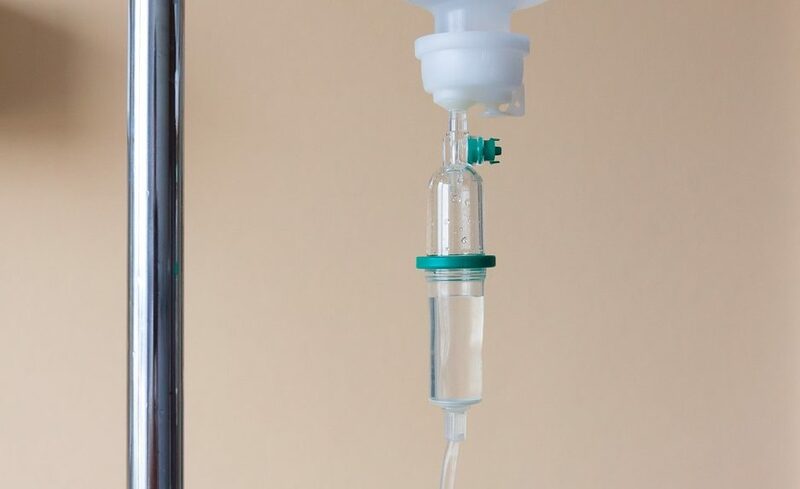 Most of you will recognise Herceptin (trastuzumab) for the controversy that surrounded it, rather than for the breast cancer treatment drug itself. Breast cancer which is human epidermal growth factor receptor-2 positive (HER2+ for short) is more aggressive than other types of breast cancer. 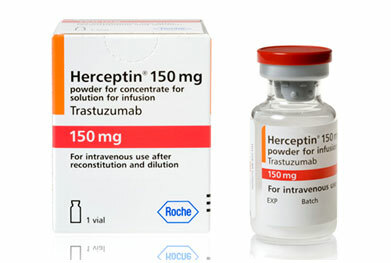 Herceptin is a drug that targets that receptor. PHARMAC’s decision in 2006-2008 to fund the nine-week course of Herceptin rather than the 12-month course was based on their assessment of the available evidence at the time, but caused public controversy. To cut a long story short: it gave rise to a legal challenge, a High Court-ordered reconsideration, 300 public submissions, a re-confirmed PHARMAC decision, and finally an over-ruled PHARMAC decision as the 12-month course of Herceptin evolved into an election promise eventually fulfilled by the incoming National Government. That’s just one example of the challenging reality of allocating limited financial resources in the face of unlimited, competing health demands. Even more challenging given that there are real people at the receiving end of such important decisions, and real people missing out on alternative new interventions. For every health intervention that gets funded, something else doesn’t. All the more reason why funding decisions should be informed by the best, most precise kind of objective evidence that our society is capable of. We attempted to do just that, in a just published cost-effectiveness analysis of Herceptin. To be clear, this was a retrospective exercise: a one-year course of Herceptin for women with HER2+ breast cancer is standard care in New Zealand right now, and fully funded. But looking at it retrospectively makes for an interesting case study. We know that HER2+ breast cancer is more aggressive and more resistant to standard chemotherapy, resulting in a poorer prognosis. We know that in patients where the cancer has spread regionally (to nearby tissue or lymph nodes as opposed to distant organs like the liver), a 12-month course of Herceptin is usually added to standard chemotherapy, which further reduces the risk of death by a third. We know the cost of 12 months of Herceptin is roughly about NZ$68,000 as per the Pharmaceutical Schedule. Generally speaking, most high-income countries have found that Herceptin is regarded as pretty cost-effective compared to no Herceptin. With that as a starting-point, we chose to ask a deeper question: how does the cost-effectiveness of Herceptin vary by type (hormone receptor) and age for HER2+ early stage breast cancer that has spread regionally? We specified four different types of HER2+ breast cancer based on the presence or absence of two other protective hormone receptors: oestrogen receptor status (either ER+ or ER-) and progesterone receptor status (either PR+ or PR-). For the purpose of this blog, think of these four combinations as a “prognosis spectrum”. At one end, individuals with HER2+/ER+/PR+ breast cancer have the best five-year survival (70-80% depending on age), and at the other end HER2+/ER-/PR- have the worst (35-50%), even before Herceptin comes into the picture. And by age, the older one is the higher the ‘competing mortality risk’ and therefore – other things held constant – the smaller the envelope of potential health gain from treatment. So how did the cost-effectiveness of Herceptin vary across age and these four hormone receptor types of HER2+ breast cancer? Answer: dramatically. The figure shows the cost per QALY gained – the less one spends per QALY gained (ie the lower the height of the column in the figure), the better (ie more cost-effective). There are two key patterns in the graph: cost effectiveness is better for ‘worse prognosis’ hormone types (ie hormone receptor negative); and cost effectiveness is better for younger women. Why? First, if you step back, this makes intuitive sense: the poorer the prognosis, the more “room to improve”, and the greater the added health gains from Herceptin, and therefore the more favourable the cost-effectiveness. And vice versa. Second, by age the older one is the greater the competing mortality risk (eg from another cancer, heart disease, etc) meaning that the benefits of a ‘good treatment’ like Herceptin may not actually be realised as prolongation of life. 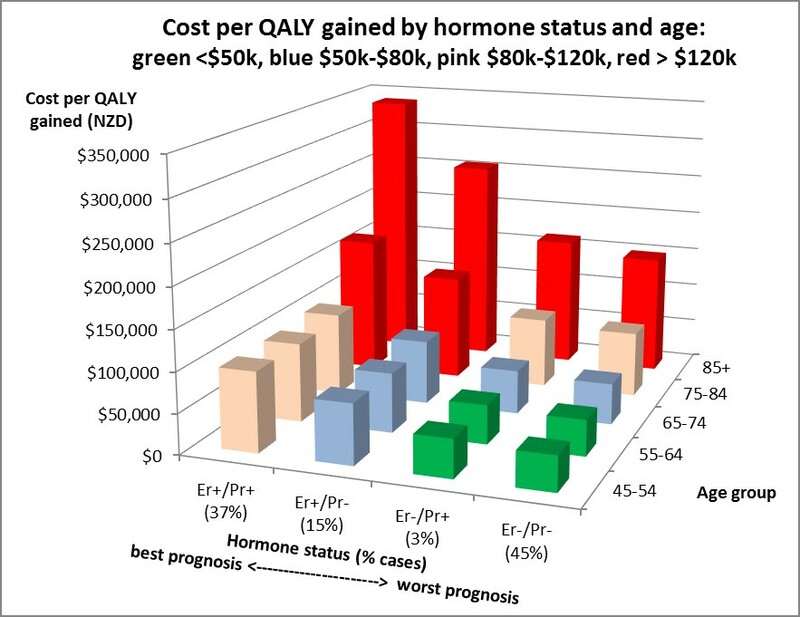 This joint heterogeneity by type and age means that Herceptin is cost effective against a $50,000 per QALY gained threshold just for the young women (less than 65 years of age) with poor prognosis cancers (most notably ER-/PR-, or nearly half of HER2+ breast cancer cases). Then one spreads out to the blue, then pink, bars in the figure if one is prepared to spend up to $80,000 and $120,000 per QALY gained, respectively. In actuality, with PHARMAC getting better and better drug prices, and biosimilar drugs coming on the market, cost effectiveness will improve. In short, the epidemiological and biological ‘starting-point’ makes a big difference to cost-effectiveness. We used Herceptin as an example here, but it could be many other types of drug or health intervention. We used hormone receptor status to define disease severity here, but equally we could have used any clinical grouping. We sliced this analysis up by disease severity and age here, but we could have done so by other factors. Are these differences just kind of interesting, or do they really matter? Ignoring these differences risks masking that an intervention that is cost-effective on average for a population, may not be cost-effective for specific population subgroups. Or vice versa. A decision-making agency might decide to fund an intervention for everyone, without realising it’s only cost-effective for some. Or decide not to fund an intervention for anyone, without realising it’s actually cost-effective for some. Of course there are clearly many other considerations that policy-makers need to consider when deciding about new interventions, such as public acceptability, impact on inequalities, feasibility, upfront cost, etc. But cost-effectiveness is an important factor, and usually the one we know the least about. Neither are we saying that this is easy. For example, many people – and Government Agencies and rights-based approaches – argue we should not discriminate by age. But our society still does it ‘under the radar’ at the bed-side (eg families requesting that their elderly parent not receive an invasive procedure). Sometimes we do it ‘on the radar’ in some policies (eg screening programmes are only offered to the ‘sweet spot’ age range of maximal cost-effectiveness). But there are many instances where we do not consider population sub-group ability to cost-effectively benefit eg, all New Zealanders get emergency care after an injury – no matter age or other pre-existing health problems. With a finite budget, when something gets funded, something else doesn’t. In clinical practice, personalised medicine means that medical decisions are tailored to the individual patient based on their predicted response or risk of disease. The equivalent of personalised medicine in the health policy world might just be tailoring funding decisions based on predicted ability to materially benefit, at reasonable cost. Some may call this discriminatory. Some may call this real life. Some may call this optimal, evidence-based resource allocation – and making best use of the taxpayer- funded health system. What do you think?